The problem of railway cargo transit, going from Uzbekistan to Tajikistan, has been seriously undermining the relations between two Central Asian republics for the last few months. The true reasons of difficulties, as well as the sources of their origins, are not clear. Tajik side believes the delays have no serious reasons and they are set up artificially; Tajikistan claims that situation has turned into emergency long ago. In its turn, Uzbekistan contradicts facts of delay, refers to the scheduled maintenance and announces the end of embargo. Today, we are presenting the opinion from Dushanbe and at the same time we offer Tashkent to declare clear and formulated position at our website. Since the end of November 2009 the Uzbek railways management was unreasonably allowing mass delay of transit cargo, designated for Tajikistan. This is also relevant to the strategic cargo, ensuring the national economic development and welfare of people of Tajikistan. 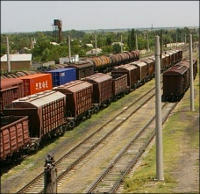 According to Rokhi okhani Tochikiston State Unitary Enterprise, at the beginning of 2010 nearly 150 wagons were apprehended by Uzbek railways. The number increased to 400 in February. Following the appeal of the Republic of Tajikistan Prime-Minister to Uzbek Prime-Minister Mirziyaev 178 wagons were released; on the other hand, even more wagons were caught at the same period while the general situation is deteriorating day by day. Thus, at the beginning of February, 2010 and until now (03.06.2010) Uzbekiston temir yullari (Uzbek railways) GAJJ station continues to retain 2000 cargo wagons, going to the Republic of Tajikistan, including 912 wagons going to Khatlon area and 1088 wagons going to Dushanbe area. Since the beginning of March through May 8 Uzbek railways has not released any single wagon, going to Khatlon area. Since May 8 only 351 wagons, mainly loaded by humanitarian aid goods, managed to reach Tajikistan. The apprehension of petroleum nearly disrupted the sowing campaign in the republic, when the landowners had to practice XVII century methods again because all technical equipment had no fuel. Due to out-of-sequence delivery of heavy machinery for running bank protection and diesel oil the abundant mud streams severely damaged the economy, social life and population of Tajikistan. In order to liquidate the consequences of the disaster, reasoned by suspended terms of machinery supply, Tajikistan badly needs the construction materials and petroleum in the damaged districts. However, in spite of several promise statements, Uzbekistan continues to retain wagons. Uzbek side alleged Tajikistan refused to accept its wagons and promised "to develop the schedule that within shortest terms will release the railway cargo, designated for Tajik economy". However, there is no clear and unambiguous answer to when the freight trains will reach Tajikistan. The management of Rokhi okhani Tochikiston state enterprise several times informed Uzbek railways that it was not possible to accept the wagons, heading to the Khatlon area of Tajik railways through Kudukli, as it was assumed by Uzbek colleagues, since this contradicts all norms and agreements on international freight traffic. According to article 20, paragraph 2 of international railroad freight agreement the agreed destinations for freights can be changed by the consignors only (based outside Tajikistan) and Tajik railways is not authorized to make decisions for them. The transfer of wagons, going to the Khatlon area of Tajikistan, through Kudukli station is under question since as of 03.06.2010 Uzbekistan was retaining 1088 wagons, going to Dushanbe, including 123 wagons with cement, 91 wagons with oil and lubricants, 53 wagons with bitumen, 39 wagons with flour and 782 with other goods. Moreover, by telegram #93, dated 05.05.2010, Tajik railways asked to forward 6 wagons with diesel oil, going to Kurgan-Tube through Kudukli, to Dushanbe-1 locomotive depot. However, this request was not satisfied and after 1.5 months of delay at Kudukli station they were directed to Kurgan-Tube through Amuzang station. Tajik railways several times reported that the reasons, brought up by Uzbek side, are totally unreasonable. If Uzbekistan continues the embargo, this may cause multimillion damage to Tajikistan, threatening the food and communication security of the republic. In the first quarter of 2010 the volume of Tajik railways transit cargo dropped by 40 percent, comparing to similar period of 2009. At the same time, Uzbekistan does not authorize the pass of the strategic cargo, ensuring the economic development of Tajikistan. Referring to the necessity of scheduled maintenance at the Amuzang-Galaba part that should have been run without stopping the trains, Uzbek side does not attempt real measures to resolve current issue, except for empty statements. Uzbek side ignored the offers from Tajikistan to sponsor the repairs, although in this period it would be possible to build new road line, such as 20 kilometer long Termez-Khairaton, erected by Uzbekistan. Tajik Prime-Minister Akil Akilov and UN Secretary General Ban Ki-moon also addressed Uzbekistan with the request to pass Tajik freight wagons. The International Monetary Fund declared that the railroad stagnation threatens the economic safety of the mountainous republic. Uzbekistan does not meet international obligation on passing non-military cargo of Tajikistan. The appeal of Tajik Railways management to Uzbek colleagues, dispatch center of the Council for CIS railroad transportation, its Chairman Yakunin and department manager Kucherenko with the demand to resolve the problem as soon as possible made no effect. The volume of stagnant freight has doubled. The Tashkent meeting of Tajik-Uzbek intergovernmental commission did not change things. It was brought up at the meeting that the wagons detention in Uzbekistan is reasoned by the initiation of the repair works at the Rogun hydropower plant. The delay of the transit wagons was also discussed at CSTO session, dedicated to The Structure of Collective Security in Central Asia – 2015. CSTO Secretary General Nikolay Bordyuzha hoped for soonest resolution of the problem. Washington DC is also in. David Petraeus, US Central Commander arrived in Tashkent to ensure the cargo transit to Afghanistan. The meeting with President Karimov also discussed the transit of non-military cargo through Uzbek territory and expansion of the transit routes. "The expansion of US and NATO troops in Afghanistan needs the expansion of transit routes and Uzbekistan plays important role in this process”, Mr. Petraeus underlined. - Bilateral Tajik-Uzbek "Agreement on relations in railway transportation".